This is a blend of several distillations of corn, rye, malted rye and barley, which are then combined and matured in once-used white oak bourbon barrels, producing a golden liquid. It is a light, sweet whisky with well-balanced rich butterscotch, vanilla and orange-rind flavours, and a zesty bitterness to finish. 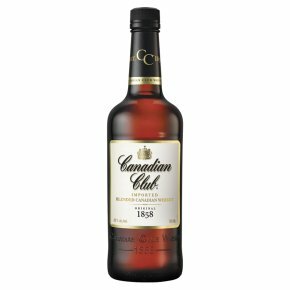 Whisky Canadian Club Appearance Pale amber. Nose Fresh, soft and nutty, full of spice, apple and vanilla, Palate Smooth and sweet, slightly spicy and woody with undertones of zest and vanilla. Finish Clean and dry with a subtle lingering wood taste.